Can the power of our thoughts influence the physical world around us? What if we could see our intentions, hopes, and fears displayed before us? Could these images allow us to connect with our deeper selves, with others, with our departed loved ones? Windbridge Institute husband and wife research team, Mark Boccuzzi and Julie Beischel, PhD, spent a year exploring these and other questions relating to the extended nature of consciousness and the connections that exist between our minds and the physical world. 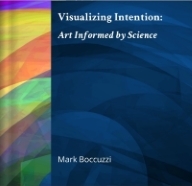 Visualizing Intention explores the development and application of their research. 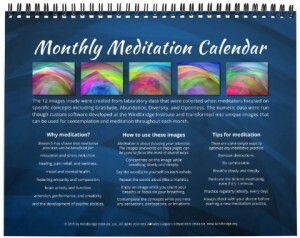 It also includes 12 images created from data collected while meditators focused on specific ideas. 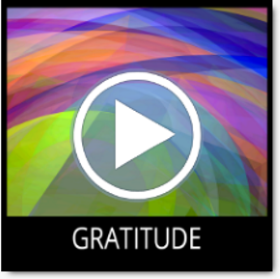 You can use these images as the focus of your own meditations. 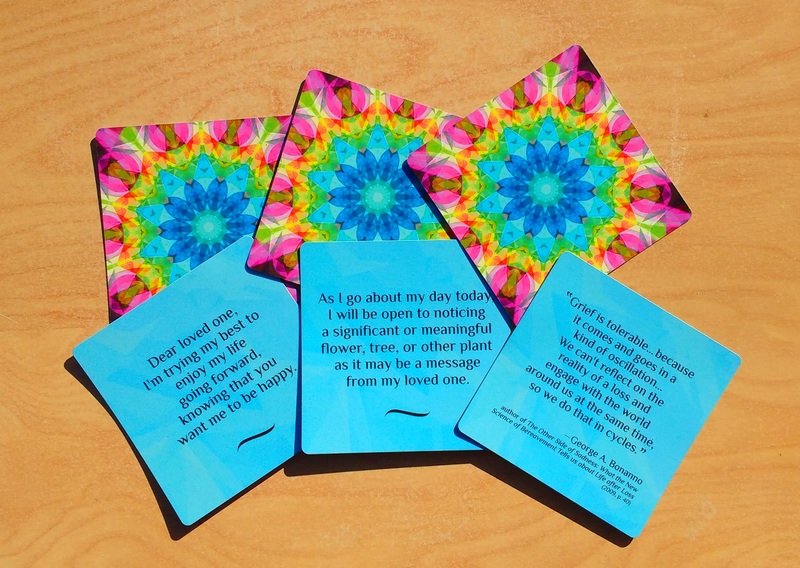 This deck of 12 cards were created from data that were collected from a Random Event Generator (REG) while a group of meditators focused their intention on the specific ideas that are listed on each card. 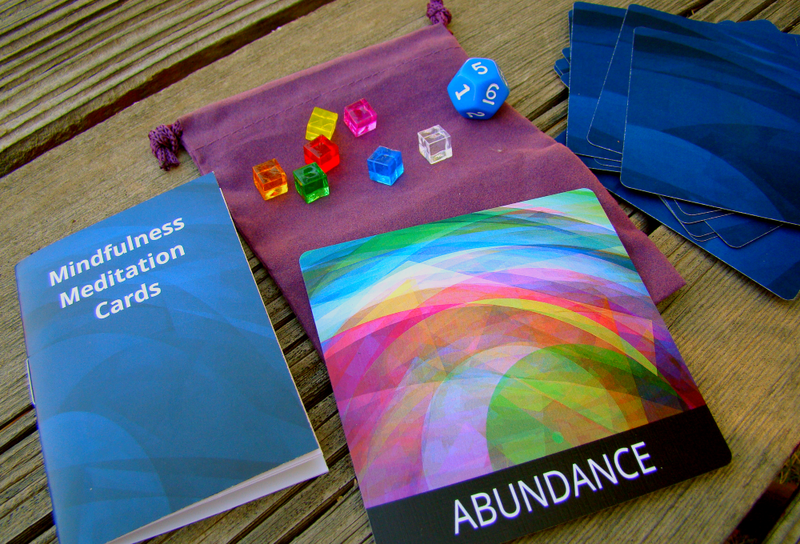 The set contains: 12 full-color cards ~ 1 instruction booklet ~ 1 12-sided die ~ 7 colored cubes (Choking Hazard! Keep out of reach of children!) ~ 1 draw string storage pouch. 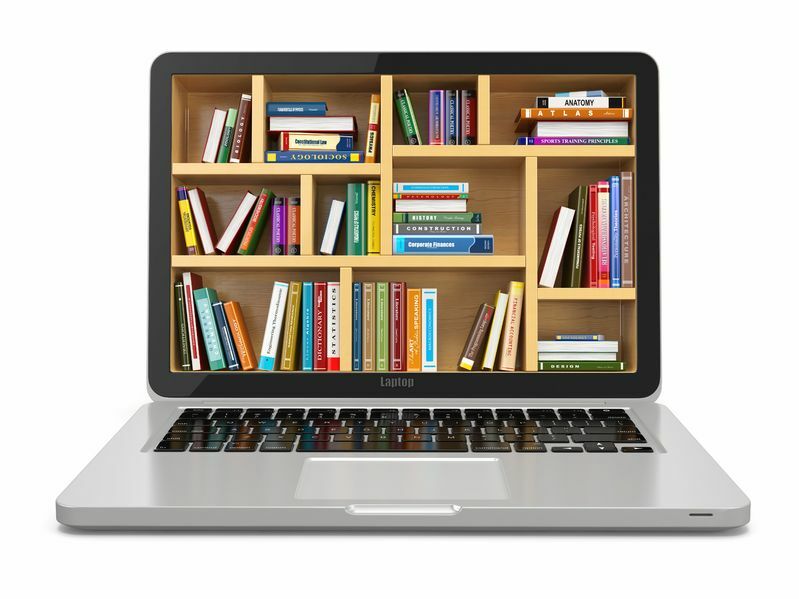 Click here to order your set today! 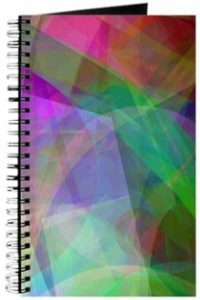 This spiral notebook measures approximately 5″x8″. Features 160 pages of 60 lb book-weight acid free paper (choose blank, dot grid, ruled, or task page format, as available). Each journal is wirebound in black wire with a professionally printed heavy front cover & flexible plastic back. Use this spiral bound notebook to keep notes and journal about your daily mindfulness meditation practice. Sold through CafePress.com. Be sure to check the CafePress site for any promotional deals! Meditative practices can improve health, stress, mood, brain function, and psychic abilities. 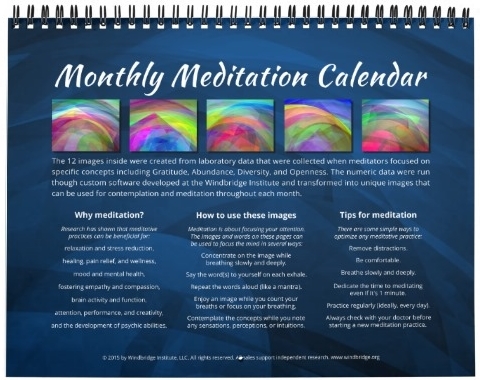 Use the laboratory-created images in this calendar each month for meditative focus or contemplation. These images, featured in the book Visualizing Intention, were created from data that were collected during sessions in which meditators focused on affirmations. Make these part of your daily mindfulness practice. A selection of images from the book are available as framed prints. 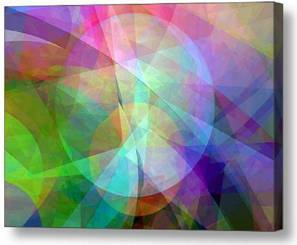 Images can be produced as Stretch Canvas Prints, Framed Prints, Metal Prints, Acrylic Prints, and more. PsiSongs are musical tracks created from the same type meditation data used to create the PsiForm images. To create these tracks, REG data are used by a software audio sequencer developed by Windbridge Institute, LLC researcher, Mark Boccuzzi in the ChucK programming langue. These tracks are still being produced but you find the current ones listed on our Nimbit site. You can preview tracks on-line or purchase them for your music library. Click here to visit the Windbridge Institute music store. Abel, I. (2013). Manifestations of Mind in Matter: Conversations about Art, Science, and Spirit. ICRL Press. Dossey, L. (2013). One Mind: How Our Individual Mind Is Part of a Greater Consciousness and Why It Matters. Hay House. Radin, D. (2009). Entangled minds: Extrasensory experiences in a quantum reality. Simon and Schuster. Pamela Rae Heath, M. D. (2011). Mind-matter interaction: A review of historical reports, theory and research. McFarland. Cardeña, E., Palmer, J., Marcusson-Clavertz, D. (2015). Parapsychology: A Handbook for the 21st Century. McFarland. May, E., & Marwaha, S. (2015). Extrasensory Perception: Support, Skepticism, and Science. Praeger. Carey, B. (2007). A Princeton Lab on ESP Plans to Close Its Doors. New York Times. Jahn, R. G., Dunne, B. J., Nelson, R. G., Dobyns, Y. H., & Bradish, G. J. (2007). Correlations of random binary sequences with pre-stated operator intention: A review of a 12-year program. Explore: The Journal of Science and Healing, 3(3), 244-253. Nelson, R. D., Jahn, R. G., Dunne, B. J., Dobyns, Y. H., & Bradish, G. J. (1998). FieldREG II: Consciousness field effects: Replications and explorations. Journal of Scientific Exploration, 12(3), 425-454. Jahn, R. G., & Dunne, B. J. (2005). The PEAR proposition. Journal of Scientific Exploration, 19(2), 195-245. Jahn, R. G., & Dunne, B. J. (2009). Margins of reality: The role of consciousness in the physical world. ICRL Press. Jahn, R. G., & Dunne, B. J. (2011). Consciousness and the Source of Reality. ICRL Press. Cooper, C. (2012). Telephone calls from the dead. Tricorn Books. Emoto, M. (2011). The hidden messages in water. Simon and Schuster. Radin, D., Hayssen, G., Emoto, M., & Kizu, T. (2006). Double-blind test of the effects of distant intention on water crystal formation. Explore: The Journal of Science and Healing, 2(5), 408-411. Radin, D., Lund, N., Emoto, M., & Kizu, T. (2008). Effects of distant intention on water crystal formation: A triple-blind replication. Journal of Scientific Exploration, 22(4), 481-493. Rasband, W.S. ( 1997-2014). ImageJ, U. S. National Institutes of Health, Bethesda, Maryland, USA. Reas, C., & Fry, B. (2007). Processing: a programming handbook for visual designers and artists (Vol. 6812). Mit Press.